I have twenty pages of handwritten notes from this weekend. Twenty. So, you can see the trouble I’m having tonight in attempting to convey what I learned over the past two days at Verge. If you want the long version, call me and we can meet for coffee or a beer, because I am still too tired to even try to write all of that out. You’re getting the “I can’t stop thinking about this today” version of Verge. 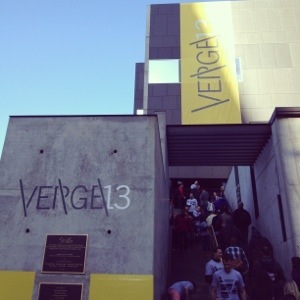 All of the talks at this year’s Verge were about Making Disciples. Content and delivery differed greatly, and my mind was a bit chaotic during the sessions, attempting to take in all of these great ideas and thoughts and truths. Today, I kept thinking about family– specifically treating people like family. Yesterday, Dave Gibbons gave a talk where he shared that when we think of disciple-making, we should think “home”– specifically family. I should treat others the way I would treat family– invite them in, eat with them, share my things, live life together. I started to think about the people who challenge my patience, or those who I think are living lives they shouldn’t. Jesus has called me to love these people, but sometimes that feels very abstract to me and I find myself not knowing how to love them. Treat them like family. I’ve been thinking a lot about this today– with specific faces coming to mind and then wondering how I would act towards that person if they were my sibling. It’s challenging, yes, but makes a lot of sense to me. I will continue to think on this. Other things that keep coming to mind today are the stories I heard in the Story Team trailer. 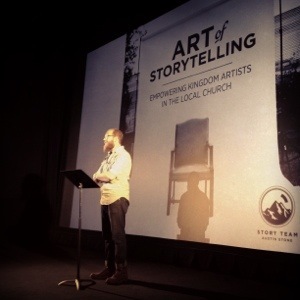 Normally on Story Team, we tell the stories of what God is doing in our own church. At Verge, we invited people from all over the country to come in and share. The Airstream trailer was set up beautifully. At the far end, bright cushions invited the interviewer and guest to plop down. The narrow counter tops held framed photographs portraying some of what we do– a camera man filming a couple on a couch, or the story trailer/van from last year’s Verge conference. Vintage cameras and film filled in the empty spaces. Accordioned gray baffles lined much of the curved walls and black and white rugs covered much of the faux hardwood floor. A large microphone stand sat in the middle of the trailer, its long arm reaching towards the guest. I spent much of yesterday in the trailer listening to the stories of women. They told of hardships and struggles, or the dark and messy parts of life. Then they would tell of prayer and reconciliation and miracles and redemption. God is moving and he is doing amazing things all over the place. These were just regular women, but they told powerful stories they were ministering to my heart. They reminded me that nothing is impossible for God and even with weak faith in him, he still does great things. I have less fear today. I look at the future differently today. It’s late, and we’re beat. We had a great weekend with our community, exploring new ideas on discipleship and hearing from great teachers. Even better was our chance to work and serve together for The Story Team, which has been such a good thing for us. I love my wife desperately, and serving alongside of her is awesome. My head is so joyfully chaotic right now that I can’t quite think straight to write. I have pages of notes after a entire day of truth-filled teaching. I feel like Brian and I have so much to talk about! We sat next to each other all day, taking all of this in side by side, but now I would really like to process it with him. 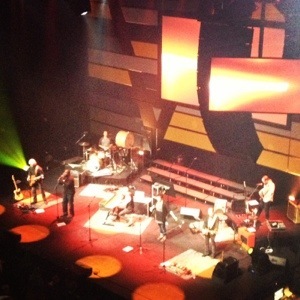 Verge is taking place at the Moody Theater, home of Austin City Limits Live. The Story Team had its own workshop– one of the best parts of the day. So blessed to be a part of this team! Excited for day two, tomorrow! I put together my sub plans, ran my errands, picked up Chuy’s, and came home to plop on the couch with my husband. The greatest part of Friday-on-Thursday is that there’s better TV 🙂 Brian and I enjoyed our favorite Tex-Mex and watched that better TV. We both thought back and neither could recall the last time we did this. Literally. Brian and I are going to the Verge conference tomorrow in downtown Austin. We’re both pretty excited. Several favorite pastors are coming to speak, and we may be most excited about the Story Team trailer set up outside the conference. Conference goers have signed up for slots to come in and share their stories of what God is doing in their lives. I can’t believe I get to be a part of that! I wrote a few weeks ago about the time I get to spend with the guys from my Men’s Development Program community and how valuable it is to me. Time and time again these guys have proven to me the truth contained in the verse above. They make me a better man by holding me to a high standard, confronting me in love when I fail, struggling through the tough times with me, and encouraging me in my success. They are a critical part of my life, and I’m starting to learn that they are a critical part of my marriage. Tonight I spent several hours after class with my group of guys, and it was such an encouragement. Laughing and joking around is fun and a great way to unwind, but these guys also pose tough questions. They push and probe about what I think and say. They don’t let me off easy. They hold me to account, and want the best things for me. Nights like tonight are like water to a thirsty man for me. They are not negotiable. I think every married man needs to have a community of men around them like this. I can truly say that my marriage is in better shape because of the counsel and correction that these men have given me over the last seven months. Their help and love for Lindsey and I is invaluable. So, married men this is my piece of advice for the day, if you don’t have men like this in your life, find them. Wives, if your husband does not have this, lovingly encourage him to seek it out. We are not prompted to change on our own, its too comfortable. We need to be challenged, and that is what a strong community of men can do for each other.